A few kilometers next to the Zabljak Crnojevica is our next destination, the River Cijevna waterfalls, where we will stop to have a lunch break in a national restaurant. Podgorica is unique in Montenegro for its five rivers flows: Zeta, Moraca, Cijevna, Ribnica and Sitnica. Unlike other 4 rivers, Cijevna does not flow through the city center, but very near. So in just 15 minutes from amazing Skadar Lake we will be at this beautiful hidden river that will delight you with its small canyon and beauty. The river is just few meters wide but thanks to its rocks and sun beam reflection, it has impressive indigo blue clear water. In and around the restaurant you will see a variety of animals such as rabbits, ducks, turkeys and geese that often walk around tables asking to feed them, that is always fun. When we finish our lunch break at Cijevna. From this viewpoint you can see Montenegrin famous vineyard “Plantaže”, one of the largest in Europe. After the lunch we will go straight to Plantaže where the guests will be able to drive through the vineyards with a tour train and after that guests will go to wine cellar Šipčanik and experience the impressive ambience of this unique wine cellar, enjoying the unforgettable scents and tastes, the "bouquet" of wine Vranac-the national pride of Montenegro. Guests will be able to take domestic Njegusi cheese and tasting wine. Guests can also buy some bottle of wine for discount prices. Cellar has the shape of a tunnel, 356 meters long, with an average width of 13.5 meters, 7 meters high. The air temperature ranges between 17 and 19 degrees, with 70-80% humidity. 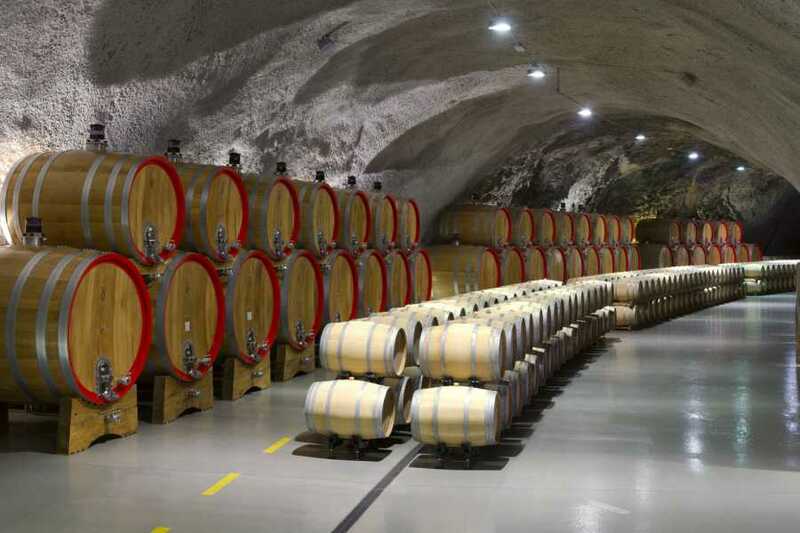 Wine is kept and ageing in this cellar across nearly 7,000 square meters, in almost ideal and fully natural conditions in terms of climate and technology. Two million liters of wine age and mature in wooden barrels and bottles. The cellar includes a wine shop with 28,000 bottles of wines up to ten years old, a tasting room of 200 square meters and a specialized shop. The tasting room is 50 seats in capacity thus being an ideal venue for meetings, seminars, conferences and presentations. NOTE: Entrance fee for Medun of 1 euro, and entrance fee in Spicanik of 12 euro is not included in the price as well as lunch on River Cijevna. Those additional costs can be from 15-25 euros. But if you want you can bring your own food and drink. The price for the tour includes licensed tour guide in English language. Tour is organized with an air-conditioned car or mini van.